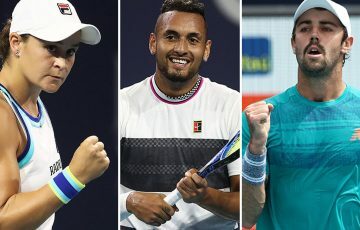 Alex De Minaur found a resurgent Jo-Wilfried Tsonga too strong in the Brisbane International quarterfinals after Ajla Tomljanovic fell to Karolina Pliskova in a topsy-turvy affair. Jo-Wilfried Tsonga has shown no signs of a seven-month tour absence through injury last season, reprising his form of more than a decade ago to beat Australian Alex De Minaur in the Brisbane International quarter-finals. 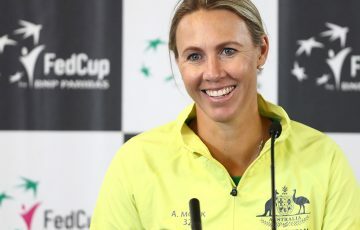 The 2008 Australian Open finalist had knee surgery last year, but the 33-year-old piloted his big frame expertly around Pat Rafter Arena in a 6-4 7-6(2) win on Friday night. Earlier in the evening, Ajla Tomljanovic played an excellent second set but found former world No.1 Karolina Pliskova – a champion in Brisbane in 2017 – too strong, going down 6-1 1-6 6-1. 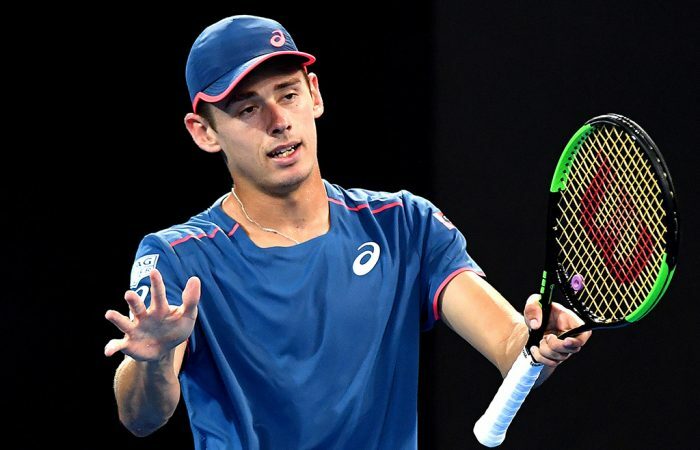 The 19-year-old De Minaur was typically resilient in defeat, hanging with the Frenchman in a high-quality contest without managing any knock-out blows. Tsonga burst out of the blocks, bullying the Sydney teenager to jump ahead 2-0. But de Minaur scrambled well in the next game to jag a point he should never have won and was rewarded with the next three points to break straight back. Tsonga staved off break points in the next game and then really found his groove, high-fiving the crowd after a nifty one-handed backhand winner from deep in the court. The Frenchman pounced in the ninth game, drilling big winners from both wings to grab the decisive break and serve out the set in 42 minutes. 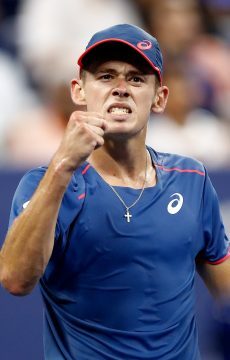 De Minaur, who announced himself with a semi-final charge in Brisbane 12 months ago, ran and ran in the second set as Tsonga blazed away. He even busted a shoe as he came within a whisker of breaking in the sixth game. Tsonga saved all three break points though and was untouchable in a devastating tiebreak that bodes well ahead of another Australian Open campaign. “I played a great match; I expected something like this before the match because I saw him play a few times,” Tsonga said. “He’s a very good player. We have completely different games; it was good tennis. Tsonga with meet 22-year-old Russian Daniil Medvedev in a Saturday night semifinal, while Jeremy Chardy plays Kei Nishikori for a spot in the final earlier in the day. 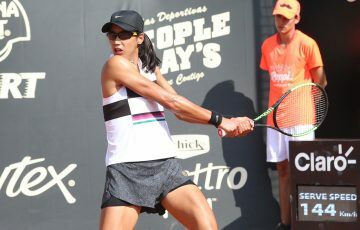 Tomjlanovic went down swinging in the quarterfinals, a curious contest that lasted just 84 minutes and featured violent swings in momentum in each set. 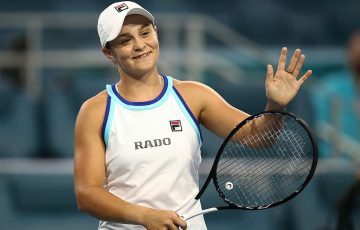 The world No.46 was smothered in the first set by the tournament’s fifth seed, before turning the tables in a brutal second set display only to see history repeat itself in the decider. Pliskova will meet Croatia’s Donna Vekic in a Saturday night semifinal. Tomjlanovic, 25, would have moved inside the world’s top 40 for the first time with a victory over Pliskova. But that looked a distant prospect in a 28-minute first set though, as the Czech star bullied Tomljanovic’s serve and looked to be cruising in second gear. 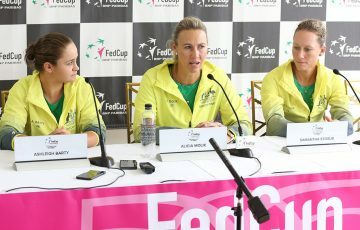 Tomjlanovic, who had twice beaten opponents ranked higher than her to reach her first Brisbane quarterfinal, responded. 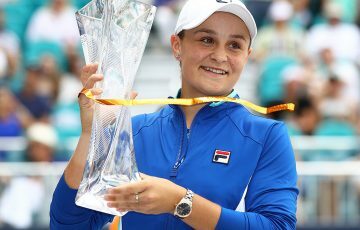 She returned in the second set full of intent, fearlessly flattening out her groundstrokes and breaking Pliskova to love as she built a 5-0 lead. 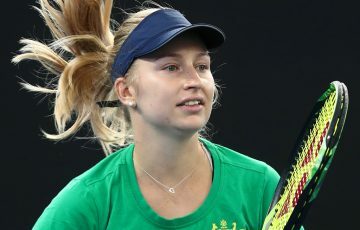 The local hope could do no wrong as she saved a break point with an audacious drop shot then sealed the set with a superb running forehand winner. But order was quickly restored by the favourite in the decider, who mixed 27 winners with 16 unforced errors compared to Tomljanovic’s 19 and 29 respectively.